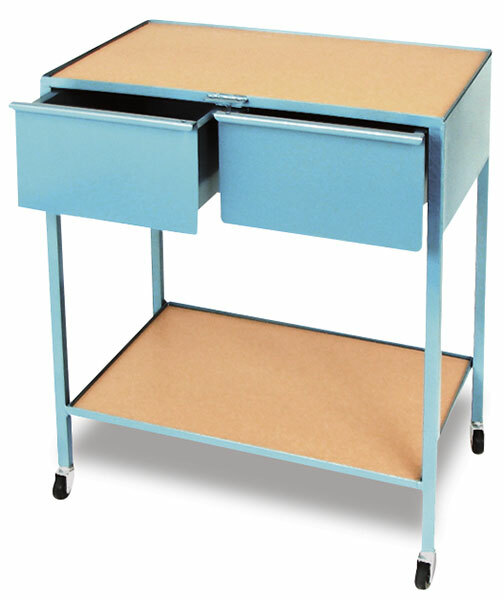 Klopfenstein's industrial-strength taboret was designed to provide years of hard, everyday classroom or studio use. Each taboret is constructed using a heavy-gauge, welded steel frame. This means there's no nuts or bolts to break or work loose over time. Top and lower shelves are hardboard, solidly supported on rigid steel angle iron frames with a 3/8" high lip to keep materials such as a glass palette in place. Spacious all-steel drawers are fitted with stops to prevent them from accidentally being pulled all the way out. Four hard rubber casters attach easily, making this taboret easy to move. Vertical Drawer Taboret — Drawers measure 6"H × 14-1/2"W × 18¼"D (15 cm × 37 cm × 46 cm). Top and lower shelves measure 18"W × 18"D (46 cm × 46 cm). Overall dimensions are 36-1/4"H × 18"W × 18"D (92 cm × 46 cm × 46 cm). Shipping weight is 70 lb (31.8 kg). 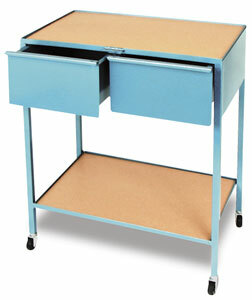 Horizontal Drawer Taboret — Drawers measure 6"H × 12"W × 18-1/4"D (15 cm × 30 cm × 46 cm) and are each lockable. Top and lower shelves measure 30"W × 18"D (76 cm × 46 cm). Overall dimensions are 33-1/2"H × 30"W × 18"D (85 cm × 76 cm × 46 cm). Shipping weight is 80 lb (36.3 kg).